Electronic gadgets and devices are present in every inch of human existence. So, it becomes equally important to design and develop such systems which help in better interaction and control. At present, such a design and development process is carried out using computer-based software followed by the fabrication process. It is important to learn this process to carry out such operations at an individual or a large scale level. To equip the undergraduate students of B.Sc.(Hons.) Electronics and B.Sc.(Hons.) 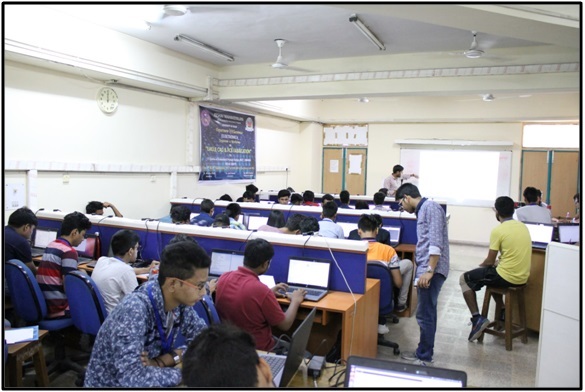 Computer Science discipline of Keshav Mahavidyalaya, Delhi University with skills of design and development of Printed circuit board (PCB), a two day workshop for the same was undertaken by Sincgrid with academic support from CEDT, NSIT. A total of 48 students participated in the workshop from 1st and 2nd year. 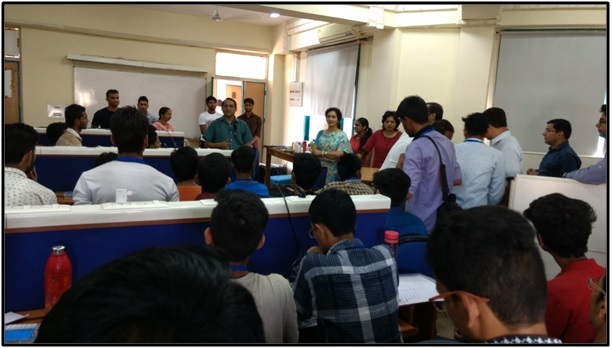 Day One of the workshop involved the students in learning nuances of EAGLE CAD software. EAGLE CAD software is industry standard used for PCB designing and making Gerber files, it is available for free usage by educators and students.Importance of the design process was illustrated through various PCB designs, with the explanation of critical aspects such as selecting the right package to suit particular applications. 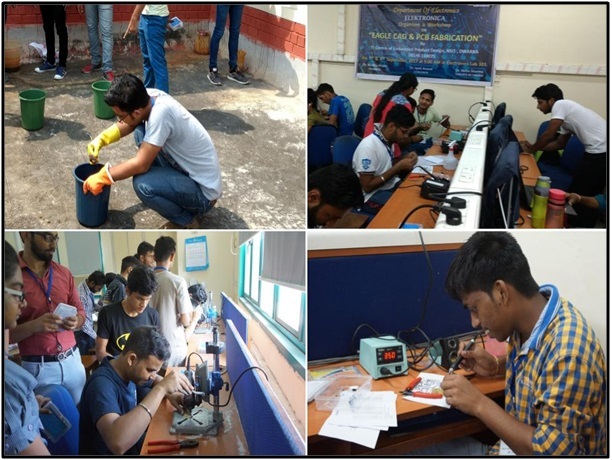 Students showed a keen interest in this process, they were detailed about the schematic designing process which is analogous to the textbook style circuits comprising of various symbols and connections between them. Similarly, a detailed discussion on layout designing was carried out. A sample circuit of common emitter amplifier was discussed for schematic and layout designing. Emphasis was given on learning this process of moving from textbook type circuit to a physically robust, functioning circuit board. For the Second Day of the workshop, fabrication activity was planned. Fabrication of code practice oscillator (CPO) circuit, an astable multivibrator circuit based on 555 timer was carried out using toner transfer method. Fabrication kit consisting of copper clad, board layout, components and tools was provided to each participant. Each step of fabrication was explained in detail, where students noted all the steps and things to be taken care of. Each process was successfully carried out, participants enjoyed this process of fabricating a circuit board by themselves. Day Two concluded with the lecture by Prof. Dhananjay V. Gadre. He teaches at Netaji Subhas Institute of Technology Delhi, He heads CEDT ( Centre for Electronics Design and Technology) and takes great interest in design and development of systems for pedagogy and independent systems with a variety of usage. Prof. Gadre illustrated the criticality of designing embedded systems, bridging the gap between the theoretical learning and practical applications of such learning. Various standalone projects were demonstrated by Prof. Gadre. The participants gained a lot of interest in such a process of system designing. Principal, Dr. Madhu Pruthi also joined the session and she was highly satisfied with the level of work achieved during the workshop. She encouraged such environment and also suggested for more future activities like these. Positive feedbacks were received from all the participants for the various activities carried out during the workshop. Sincgrid aims to take such activities to an even better level and to different colleges and schools.